Announced to a crowd of Polish workers by Brezhnev himself, the Brezhnev Doctrine clarified the de facto policy of the Soviet Union, the Prague Spring. Namely, current socialist countries would not be allowed to abandon socialism or adopt a position of neutrality. The doctrine contributed to the Soviets’ miscalculation of world reaction to their invasion of Afghanistan. They looked upon the invasion as the mere application of this well-understood doctrine. A superb USSR Mid War headline at a time when there is usually very little good news for the USSR. Compared to Containment, it has two disadvantages: first, it comes at a time when there is less opportunity for Ops on the board, and second, if drawn by the US, it has zero effect instead of a minimal effect. 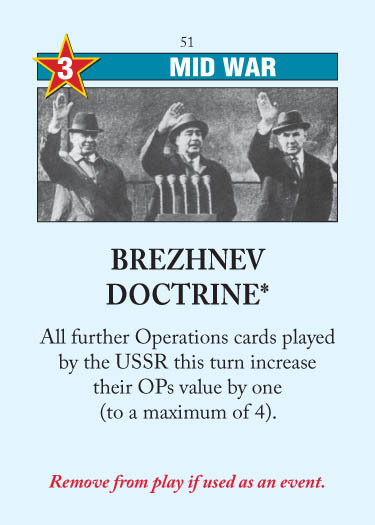 Occasionally I will hold this from turn to turn if my hand is not particularly suited for Brezhnev Doctrine (e.g., many scoring cards or no US events). But I will always headline it sooner or later. Play it on the last Action Round and be glad you drew it. This entry was posted in Mid War, USSR Events and tagged brezhnev doctrine. Bookmark the permalink. Solid advice for the US there.